The new year is the perfect time to start thinking about getting a new fence! You’ve made your personal New Year’s resolutions—to start actually using the treadmill in your basement, to spend more time with your family off your cellphone, and to floss twice a day, but what about New Year’s resolutions for your home? The new year is a great time to resolve to upgrade your property value, give the exterior of your home a facelift, and take another step in protecting your family. What are we talking about? A new fence! Aluminum is a classic fencing material that works well in a variety of residential and commercial applications. They are not ideal for high security fencing, but they are loved by many for their low maintenance requirements. They can be manufactured to look like other fencing materials and painted just about any color you can imagine. 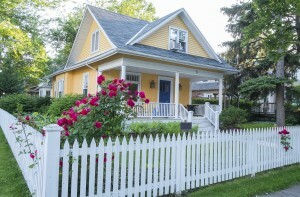 When people think of fences, they almost always think of white picket fences. Wooden fencing is the most popular type of fencing and it has a lot to offer. It works well for security or privacy fencing and looks absolutely stunning outside of residential properties. Wood conveys a sense of warmth and can really make your home feel like, well, home! Wood fences require a good deal of maintenance, so if you aren’t prepared to regularly check on your fence it might not be for you. Wrought iron fencing is perfect for people seeking a new fence that matches their personality or eclectic tastes. If you are interested in a unique design or dramatic and elegant style, wrought iron is the fencing material for you! They are very strong and work well for keeping your home secure. They require regular repair or maintenance, just like wood. Vinyl fences are very cost effective, so they are a popular choice for homeowners choosing a new fence. Vinyl fences can look like just about any other type of fence, require virtually no maintenance, and can resist staining and paint. Many homeowners love vinyl for its beautiful appearance and fantastic versatility. Ready for a Beautiful New Fence this New Year?